The Energy Top 80 Heat Only boiler from Ferroli offers state-of-the-art technology in a practical, compact unit. It's ideal for the larger domestic property, or small commercial unit. 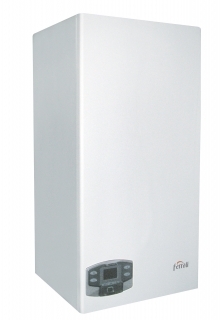 The Energy Top boiler is quick and simple to install as a wall mounted unit (lift weight 51kg), or in a cascade installation. All parts are accessible from the front, and therefore is the perfect choice where space is tight. Compatable for LPG.